The Pizza Files: Pizza Files 2010 Summer Binge, Stop Thirteen. It was Friday, and work was crazy busy. I wouldn't be leaving for home anytime soon and dispair was starting to set-in, when suddenly the Pizza Angel called. 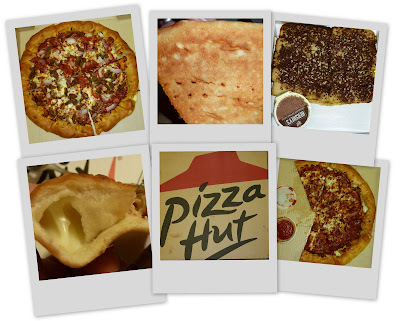 We where having pizza for lunch.... That's how Pizza Hut became stop thirteen on the 2010 Binge. We had 2 pizza's both stuffed crust (cheese in it), one with, yep you guessed it, pepperoni, ham, hamburger and onions. The second pizza was pepperoni, ham and bacon. We also got an order of Chocolate Dunkers, they were strangely appetizing. The pizza was okay, and I would eat it again as long as somebody else is paying. Don't get me wrong, I appreciate the Pizza Angel for buying it, in fact I'm glad she did because Free Pizza is Free Pizza is Free Pizza is Free Pizza is Free Pizza. Not matter where Free Pizza comes from you can't go wrong, really... I think. I'm ready to do my own pizza binge. After 11 years I ordered a new Aerostich Roadcrafter. Two sizes bigger! Let's start filling it up! Pizza really must be a true motorcyclist's food. How many foods are made so conveniently flat and cut into wedges that will slide in under the visor, after all? Two sizes bigger! That's a lot of pizza! My Shoei Multi-Tech make's it way to easy for eating pizza on the run.